After adaptations dating back to 1910, you would be forgiven for dismissing yet another screen outing of Mary Shelley’s Frankenstein, and the men who have played both the infamous titular Doctor and their human, not monstrous, creation. There have been many, and several more via television and stage; even an ex-member of Bros was birthed as the wretch. Yet none is more renowned than James Whale’s 1931 version. Even if unseen, all are familiar with its star, Karloff in that Jack Pierce make-up and it is often this and its sequel The Bride of Frankenstein, which are heralded as the yardstick by which all filmic adaptations have been measured. Not unfairly so but it was never as true to the original novel as once thought and most versions, if not all, fall down on their fidelity to Shelley’s 1818 novel. In 2015, there were two new attempts: one which received a cinema release and Bernard Rose’s. Rose, not unfamiliar with literary adaptations, has given audiences some wonderful variations on numerous works of literature: from Paperhouse (1988), Candyman (1992) to his Tolstoy quintet: Anna Karenina (1997), Ivans XTC (2000), The Kreutzer Sonata (2008), Boxing Day (2012) and Two Jacks (2012). He even claimed at FrightFest 2015 that it is comforting to have a source material to hide behind. He needn’t worry, his attention to detail and dramatic creativity really serve this story above all else. Despite the novel’s weight within the Gothic and Romantic, Rose’s 21st century Frankenstein straddles Gothic horror, the supernatural, and drama, and updates to a modern context and downtown LA. It also remains largely faithful to the original text and uses the chapters from “The Monster’s” point-of-view as the basis for his voiceover narrative and the inner monologue of Monster/Adam (Xavier Samuel). 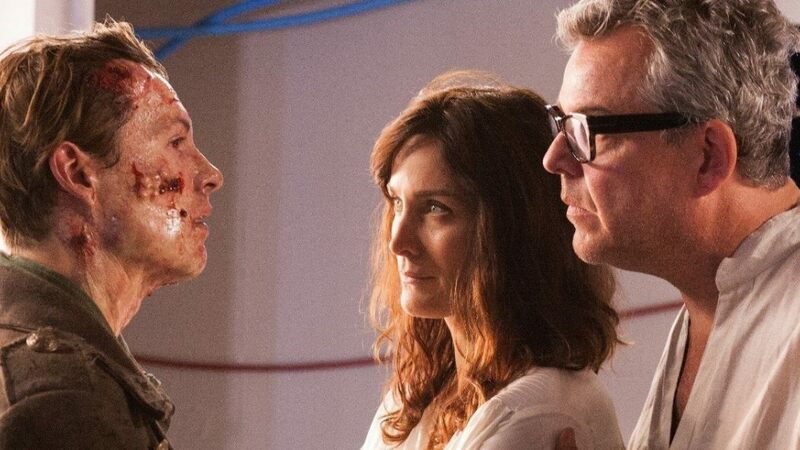 The film may be called Frankenstein but for all intents and purposes, he is one; the (brain)child of researchers Elizabeth (Carrie-Anne Moss) and Victor Frankenstein (Rose regular, Danny Huston). Adam is the result of a 3D printer which has created and shaped the human form and is the first real success in what is seemingly a long line of failures. While he resembles the form of a grown man, Adam is a baby. He is unable to support his own body weight, has difficulty focusing, eats and sleeps much like a newborn. It is an astonishing performance by Xavier Samuel who brings such soul to a role which has him largely mute for the majority of the film. Samuel has produced a fascinating and varied filmography since making (personal favourite) The Loved Ones (2009) in his native Australia and has an incredible face even under heavy prosthetics; his ability to emote in such a way is impressive. When he opens his eyes, Victor actually yells - in an obvious homage/parody however you wish to look at it of Clive’s character in Whale’s film – “He’s alive!” Once he is, so is the film. Samuel’s Adam is a creation of life not a reanimated corpse, he symbolises the advancement and the potential dangers of technology and yet is more than a metaphor. For all his physical detriments, he feels, thinks and is perfectly human; a modern John Merrick. Thankfully, Elizabeth is a partner in the research facility in Rose’s version. It is interesting that in spite of Shelley's famous feminist parentage, it is a London-born male film director who actually gives the character, Elizabeth a more prominent role. By supplanting Victor in this way, it gives more depth to the film. She is also the maternal that Adam wants to return to after his escape, and in this aligning there is a more primal notion to the story, perhaps even Oedipal reading. She is the first person he sees when he awakens and like most animals, he imprints and any notion of the ridiculous when a grown man is seen suckling from the teat of a bottle dissipates as a standing testament to Samuel’s performance. Instinctively, his first few words are ‘mama’ and dada’ which seems to touch Elizabeth more, albeit briefly, than Victor. Sadly, the new family is short-lived as necrosis attacks Adam’s tissue, the flesh-eating bacteria and breakdown of cells render him monstrous and thus he begins to associate with this and even adopts the name “Monster” for a time. Far from the perfect specimen they thought they had created, Victor and Elizabeth make the decision to essentially euthanise their infant son. From then on, Adam is alone and flees to shed his innocence and experience the world, such as it is. Noise, aggression, pollution, often violent confrontation as society greets him; when they don’t he is able to appreciate nature in all its beautiful, calming glory. It’s a motif which is dotted amongst the pages of the novel and its obvious Romanticism links are weighted in Adam’s relationship with the natural world and surroundings. This is a film, for all its brief horrific moments (amongst others, there is an appalling moment with a surgical saw… God bless Randy Westgate’s incredibly realistic looking effects make-up) about societal privilege, man’s consciousness, his commune with nature and, above all, love. Some shots are reminiscent of Botticelli/Michelangelo; religious iconography shapes the Oedipal readings while the police state which inhabits LA and preys on the homeless community keeps a tight and suffocating grasp. It’s a fascinating take on one of the themes in the original novel and one which is so palpable, resonating on a profound topical level. How many individuals are shot, assaulted and/or murdered based on the way they look? How many police officers believe they are above the law? Most will know the outcome of Frankenstein whether via the novel or the previously released films or stage productions, as well as specific plot points, most of which are restored and depicted here. The blind man is played by an outstanding Tony Todd, reuniting with Rose for the first time in 22 years. Here he is transposed as a homeless blues singer who ‘takes in’ Monster and teaches him to speak (and sing), act in company and generally fend for himself on the street and, above all, gives him hope. That is until it is cruelly taken away. It has taken approximately 85 years to produce a film on par with Whale’s and a couple of hundred to finally see one which does the novel justice and serve Shelley’s narrative. That said, Rose’s Frankenstein is as beguiling as it is beautiful, as dark as it is primal and disturbing. It’s quite the feat to breathe new life into something which has saturated modern culture and present something as visceral and emotional as this. See it, it’s stunning. By using the voiceover narrative which frames the story it affords the audience a stronger connection with the lead. Perhaps, that’s why it is so moving, cathartic and tear-inducing; he is Adam, not a monster.